Gamers eager to get their hands on the newest Star Realms stand-alone expansion will soon get their wish! The game should already be in stores in North America – and those in the EU can pick up a copy next week at Essen Spiel 2018. Command Decks will follow Frontiers into stores, about a month later. October 19, 2018 – Framingham, MA – Anyone who missed Star Realms Frontiers on Kickstarter should take note that this 1-4 player, $20 game is hitting shelves and demo tables in retail stores and conventions as early as this month. When and where you can pick up a copy depends on where you live. North American stores should have Frontiers already, while stores in Europe and elsewhere should get it in mid-November. The Universal Storage Box will follow the same release schedule. But for players in the EU who can’t wait until November, there is a chance to get Frontiers early: White Wizard Games will sell the new Frontiers, Command Decks, and the Universal Storage Boxes at Essen Spiel 2018. Players can come to Hall 1, G140 for a demo, or to pick up a copy. And for all those looking to supplement their game, the Command Deck expansions will become available in retail stores about a month after the base game. The Command Decks will release worldwide on November 14th. For players who want to try the game out but can’t make it to Essen, White Wizard Games and Double Exposure will soon roll out details on a series of demo events via their heralds in many locations, to be held in December. 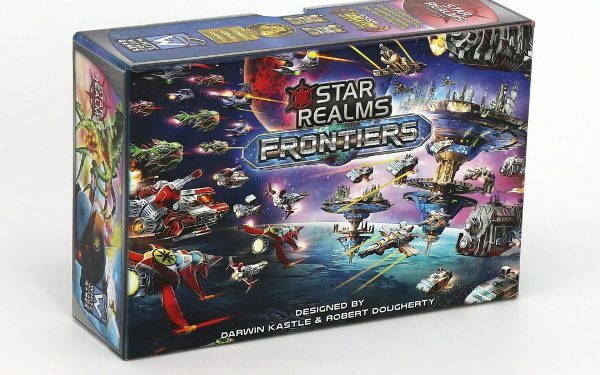 Star Realms Frontiers raised over $1 million on Kickstarter last year, placing it in the top 0.1% of projects to launch on the platform. The title is both a standalone game and an expansion for the Star Realms Deckbuilding Game, which won seven Game of the Year Awards upon its release in 2015. Frontiers offers four ways to play in one box. Players can duke it out in a duel, or in a three to four player game. Eight oversized “challenge cards” enable players to also try solo or cooperative modes. They may need to Defy The Empire, resist a Blob Assault, or fend off a Dimensional Horror. Plus, there’s plenty of new content to please experienced Star Realms players. Frontiers includes an all-new 80-card trade deck full of never-before-seen ships and bases. Star Realms veterans will discover new combos and strategies as they explore the new frontier. Most prominent among the new offerings in Frontier is the double ally mechanic: If a player can get three cards of the same faction down during their turn, they can trigger additional bonuses on some cards. The 7-cost Blob card Hive Queen, for example, provides a player 7 attack power on its own. But with one ally, it grants 10 attack power; and with two allies, it provides a total of 13 attack. The Universal Storage Box is a massive storage box that can hold every Star Realms set, sleeved or unsleeved, and a playmat. The six Command Decks allow players to take on the roles of legendary commanders that bring together the strengths of two Star Realms factions at once. These are custom starting decks that would replace the standard starting deck in Star Realms. For more information, like our Facebook page, and follow Star Realms on Twitter @starrealms. White Wizard Games LLC, was founded in 2013 by a team of seasoned professional gamers dedicated to creating games that are affordable and fun for everyone. Their first game, Star Realms, a space combat deckbuilding game, exploded in popularity and has won 7 Game of the Year awards. Their games are known for being easy to learn while also having enough strategic depth for even the most advanced gamers. The founders include Magic Hall of Famers Darwin Kastle and Rob Dougherty along with veteran app designer Tan Thor Jen and graphic designer Vito Gesualdi. Star Realms is a fast-paced deckbuilding card game of outer space combat. It combines the fun of a deckbuilding game with the interactivity of Trading Card Game style combat. As you play, you make use of Trade to acquire new Ships and Bases from the cards being turned face up in the Trade Row from the Trade Deck. You use the Ships and Bases you acquire to either generate more Trade or to generate Combat to attack your opponent and their bases. When you reduce your opponent’s score (called Authority) to zero, you win! The game is for 2 to 4 players, takes 20-30 minutes to play, and is for ages 12 and up.